Written by Alejandro González Iñárritu, Nicolás Giacobone, Alexander Dinelaris, Jr & Armando Bo. Starring Michael Keaton, Zach Galifianakis, Edward Norton, Andrea Riseborough, Amy Ryan, Emma Stone, Naomi Watts. Nominated for a total of nine Oscars, Birdman or (The Unexpected Virtue of Ignorance) is surrealist black comedy at its best. 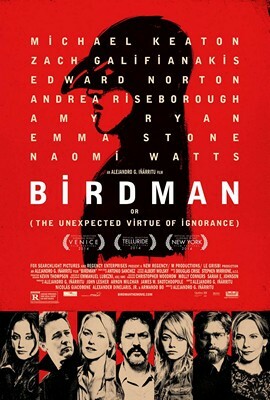 Mocking the artifice of celebrity and the entertainment industry, Birdman is a fascinating inside look into the absurd insanity of entertainment world as perceived by its protagonist, Riggan Thomson.